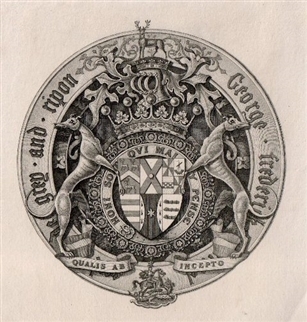 A late 19th century bookplate for the liberal politician, George Frederick Robinson, 1st Marquess of Ripon. 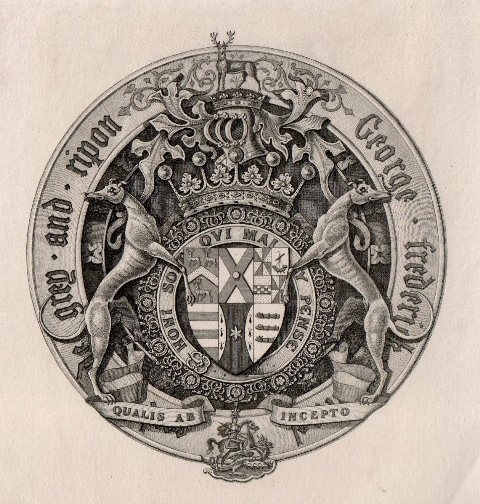 Between 1858 and 1871 he was known as Earl de Grey and Ripon and this bookplate bears this title. He was the 2nd son of the Prime Minister, the 1st Earl of Ripon, and was born at 10 Downing St. Framed in matt black with a cream mount. Approx 14cm square.